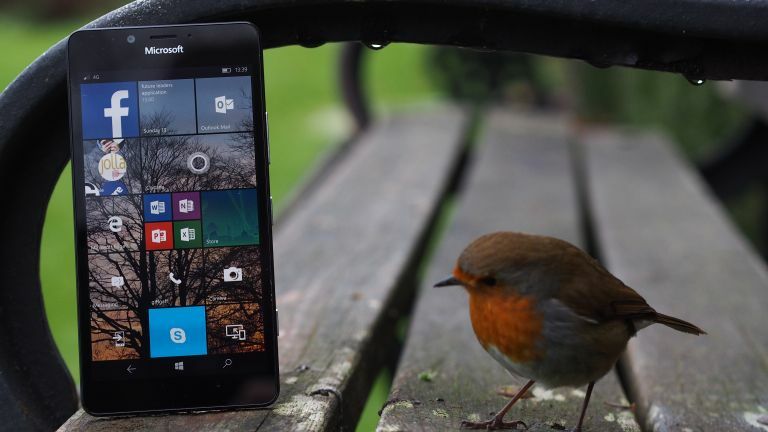 The 950 is the first elite Lumia for ages, but can it really compete? There's something about Microsoft and the concept of rebooting to solve problems. Having failed to ignite the mobile market over the past half-decade, the software giant is once again attempting to reinvent the wheel, this time with Windows 10. It is the Microsoft Lumia 950 that is intended to serve as the poster-child for this brand reinvention, and the device is impressive, at least as far as spec sheets are concerned. With a 5.2-inch QHD screen, 3GB of RAM and a Snapdragon 808 processor, it is kitted out with some fashionable internals. But with rivals like the Nexus 6P and the Samsung Galaxy S6 offering even more, and for a lower price point, has Redmond missed the boat? In the hand the Microsoft Lumia 950 feels fine, which is to damn with faint praise. Priced at over £500, it doesn't feel worth the cash outlay, especially with nicer devices costing less. The Samsung Galaxy S6 is far more premium and can now be had for less, while the OnePlus X offers a nicer build for half the price. It would have been nice to have seen something a little more special than the boring plastic slab in front of us. Whereas previous Lumias felt solid and premium the 950 just, well, exists. There is nothing defining about the device, save for an odd chrome disc positioned around the camera, looking like the designers had a few spare washers needing used. Regardless, at 8.2mm thin and weighing in at 150g, it is very comfortable to use one-handed, which is a small blessing in today's torrent of titanic phablets. The presence of a USB-C port on its base is a sign of a future and enables fast charging - but for now the cables are hard to come by. You won't want to leave yours at home if you go away, as it's unlikely someone else will have a spare. Every year at least one new feature is introduced to the fray by a leading smartphone manufacturer. Following this, the rest of the pack adopt the tech and then move on. With the Lumia 950, Microsoft has attempted to sidestep this annual melee, taking a slightly different approach to the matter. Whereas every modern flagship now sports a fingerprint scanner, following their introduction with the iPhone 5S, the 950 has something a little more futuristic: Windows Hello. That is to say, an iris scanner. Using infra-red rays (and seeming for all the world like HAL 2000 in mobile form) the services works in all lighting situations, and I found it to be generally reliable, if easily confused by glasses. Overall, Windows 10 Mobile leaves a good impression. Though similar to earlier versions of Windows Phone, it still has a strong identity of its own. Things are sensibly laid out, the live tiles are still as delightfully fluid as ever and there is a strong feeling of promise that lends hope for the future of the system. That hope is very important for any owners of this device however, as bugs, crashes and random resets are still far too common, and really beyond acceptable in a flagship device in 2015. Sporting some of the most fashionable specifications currently available, the Lumia 950 is equipped to fly with the rest. And, for the most part, this proves to be the case. Aided by the forgiving Windows 10 Mobile system requirements and abundant animations, the handset had no difficulty handling anything thrown at it. Moreover, it never became anything more than warm during even heavy use, which should be taken as a small blessing. With a hefty 3000mAh battery pack stuffed behind the removable back, the Lumia 950 had enough juice to keep going throughout the day, if not into a second. Standby performance was notably poor however, which was disappoint considering previously strong performance in this area by Lumia handsets. The 2K AMOLED screen on the 950 proved to be a treat, with strong colour calibration and endless blacks, it is one of the better we have tested. Lumias have always had strong cameras, and the Microsoft Lumia 950 is no exception. The real trick to it success is the 'Rich Capture' mode however. Once a photo is taken, Rich Capture then edits the image into a usable JPEG before your eyes in the gallery. This could mean adding another image for extra sharpness, working to brighten shadows or simply adding more saturation, among many other things. And for the most part, the images produced are quite lovely. Sporting great colours, no excessive sharpening and a smart approach to noise reduction, this is one of the best snappers to grace the Lumia line-up. Unfortunately, although loud, sound produced by the rear-firing speaker isn't anything special, being tinny at the high-end and lacking bass. Windows 10 Mobile still suffers from a real app problem, and it's one that's just not getting better with time. If you like to play the latest games and be with the hip crowd, this isn't the platform for you. With a host of bugs still to be patched, random freezes and, yes, a still noticeable lack of quality apps, the Lumia 950 really isn't a handset for everyone. For the Windows fan keen to be at the cutting edge of Microsoft's new vision it is an easy yes, but for the rest the greener pastures of Android and iOS are a far safer bet.